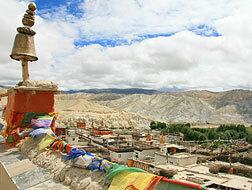 HHT Nepal's Upper Mustang Trail! 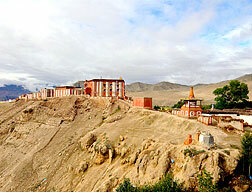 Overview: In the 7th century, Tibet conquered the Kingdom of Mustang ("Lo") and held it for more than 800 years until it became part of Nepal. This austere and arid region derives its style, culture, and language from old Tibet, and traditional culture has continued here undisturbed by Chinese colonization. 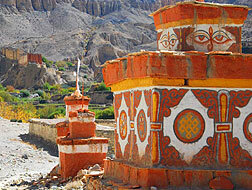 Today is an especially crucial time to visit this beautiful region and witness Mustang as it has been for centuries. 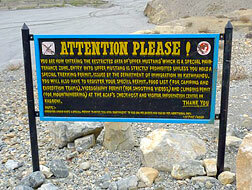 The region's main trekking trails are quickly being modernized into roads supporting vehicle traffic. This trip is designed to visit the most important sites before the cars and busses encroach and at a season when the route is less crowded with other trekkers. 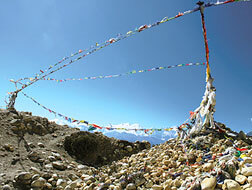 You will enjoy a moderate trek with ample rests for altitude acclimatization and for enjoying the outstanding scenery, local people and their unique Tibetan culture. We'll also be staying in newly-built lodges which are locally owned and operated. Grab this chance while you can! 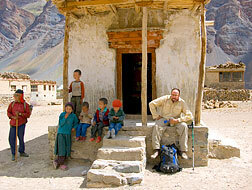 Leadership: The Upper Mustang Trek Leader is Ang Furi Sherpa. 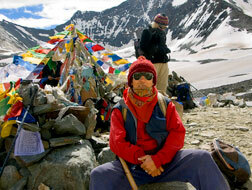 Ang Furi is an enthusiastic adventurer who enjoys travel, climbing and mountain biking in his free time. He has training as a guide and an outdoor trip coordinator. 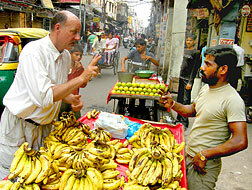 He is good with languages including English, Tibetan, Sherpa, and German. He has guided many treks including ones in remote places like Tilman's Pass in the Langtang region and Upper Dolpo to Mustang in western Nepal. 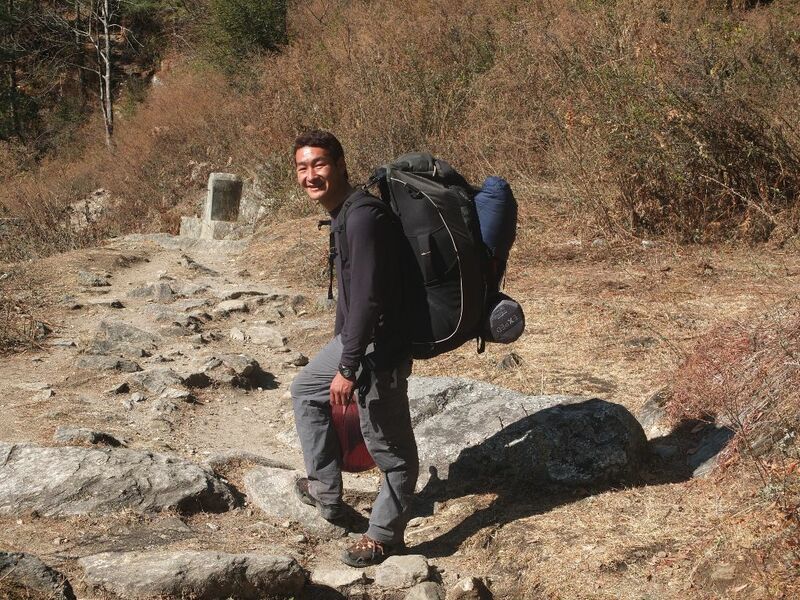 He has an understanding of different cultures (he has lived overseas) and is great at explaining Nepali culture and telling stories associated with the trekking places. Ang Furi is from Tapting village in the Solukhumbu (Lower Everest) region of Nepal where he completed his formal education at the local school. He, together with Himalayan High Treks' other staff, worked hard to help Tapting and other remote communities affected by the 2015 earthquakes. 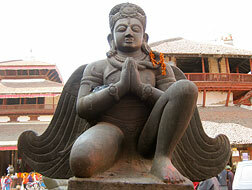 He coordinated the rebuilding of the local Buddhist center and is currently involved in ongoing volunteer work there. 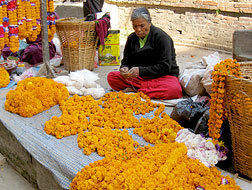 Pre Trip Days: Fly to Kathmandu, Nepal. Remember, people in the Americas 'lose' one day crossing the international date line. 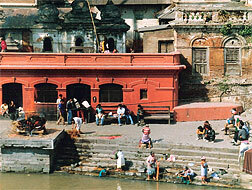 You must arrive in Kathmandu no later than September 26, 2018. 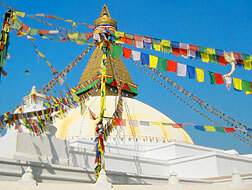 If you arrive early or depart late, we can arrange transfers, accommodations and additional Nepal services with many custom options throughout the region to enhance your stay before or after your trek! Ask us questions before you finalize your plans! 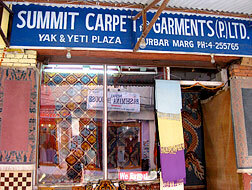 Day 4: Pokhara via Jomsom to Kagbeni. 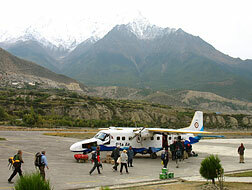 Our flight to Jomsom is before 9:00 AM. 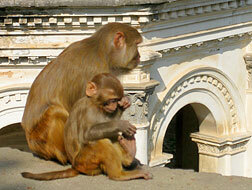 Depending on exact flight time, breakfast could be in Pokhara or in Jomsom. The short flight by a small, 15–passenger aircraft, flies through Kaligandaki Gorge between two of the tallest mountains on earth, Mount Annapurna and Mount Dhaulagiri, both above 26,000 feet. Day 6: Chaile to Syangbochen. 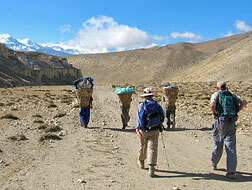 From Chaile our trek heads west, climbing a hill with both steep and gradual sections across from scenic Gyagar Village. 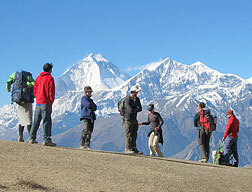 As we climb higher, the views are more spectacular with Nilgiri (23,160 feet), Tilicho (23,400 feet), Thorong Peak (20,152 feet), Yakwa Kang (21,260 feet) and other peaks. 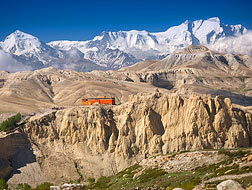 The Annapurna range fills the horizon above the beautiful panorama of nearby Mustang. Day 7: Syangmochen via Ghami to Charang. From Syangmochen we begin our day with a short climb to Syangmochen La Pass (12,628 feet) before the trail descends to Tama Gaon Village. We take the left trail from the junction at Tama Gaon and hike upwards once more to reach Jaite To Nyila Pass. 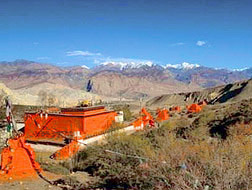 This pass is the southern boundary of Lo or Mustang itself. 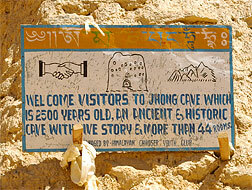 Day 9: Optional horse trip to Caves of Jhong, old monasteries and Chhosar. 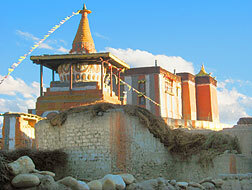 Nepal's government restricts tourists for overnight stays beyond Lomanthang. Today you have an option for a rest day exploring the surrounding region or we can ride horses (optional, additional cost) to visit the old cave village of Jhong at Chhosar. Day 11: Lomanthang via Lo Gekar to Ghami. 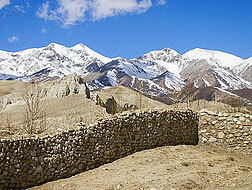 Once we leave Lomanthang we take the trail towards Marang La (13,874 feet) and Lo Gekar. This area is the highest on our trek and offers a beautiful panoramic view of the Annapurna Range, Saribung Peak and the Damodar section of Annapurna Himalaya. 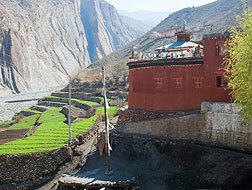 Damodar is one of the last frontiers close to the Tibetan border — its rugged landscape and ancient culture are unique. PostTrip Departure: Return travel home. Those in the Americas may arrive home the same day with the reverse travel across the International Date Line. Important Note: This is meant only as a guide to what our days will be like. Changes may be made as we go along. These depend upon local conditions, our acclimatization and safety. Sturdy vehicles are provided to and from trailheads. Provided trail times and elevations are approximate. It should be noted that this is a demanding, high–altitude trek. Good health, a high level of fitness and a positive attitude are the best tools to appreciate the trek. This kind of travel is not best for those prone to car sickness or afraid of heights. All of the areas visited are remote and there are no reliable sources of medical care outside of Kathmandu. Travel Details: Ask us about booking a room should you have an overnight stopover, wish to arrive early or stay for extra days at the end. We can arrange additional nights at any of our hotels or guest houses (comfortable deluxe rooms, attached bathrooms, wifi, room service, laundry service, a free safe-deposit box and ample luggage storage) for you as well as arrange add–on excursions throughout the region. Airport pickup for early arrivals or late departures can also be arranged upon request. We recommend that you purchase travel insurance which includes coverage for trip cancelation as well as our required emergency medical evacuation coverage. Please see our Policy section for complete information on our trip cancellations policies. Payment for additional services not specified in the itinerary may be required at the time the service is booked or received. 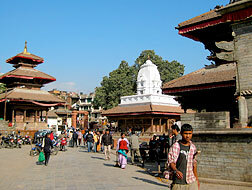 Passport, Visa(s), Physicians Visit, Emergency Medical & Evacuation Insurance, Travel to/from Kathmandu Nepal, Meals Beyond Above Itinerary, Beverages, Spending/Personal Money. guest houses and tent camping along the trail.